The HMS Beagle, with on board the amateur naturalist Charles Darwin, arrived at the remote island of St Helena on July 8, 1836, where it stayed until noon of July 14, afterwards proceeding its journey back to the United Kingdom and setting sails to the nearby island of Ascension. Darwin used these five days to explore the geology of the island and hired an elderly man as a guide. Since Van Diemen´s Land Darwin's written notes and observations had become more hasty and fragmentary - as a combination of the short stops by the Beagle on the single islands and maybe a bit of homesickness, nevertheless Darwin dedicated later one of his notebooks, written down in September to December 1938, to the island, the "St Helena Model", where he on 15 pages noted observations and thoughts on the general island geology (and also troubles with the laundry). "The successive sheets are either closely united together, or are separated from each other by beds of scoriaceous rock and of laminate tuff, frequently containing well rounded fragments. The interstices of these beds are filled with gypsum and salt; the gypsum also, sometimes occurring in thin layers. From the large quantity of these two substances, from the presence of rounded pebbles in the tuff, and from the abundant amygdaloids, I cannot doubt that these basal volcanic strata flowed beneath the sea." Fig.1. A section trough the coastline of St Helena by the hands of Charles Darwin (dated 15 September 1838), from CHANCELLOR 1990. At the time the origin of volcanoes as mountains was under scrutiny, one model - proposed by the eminent German geologist Leopold von Buch (1774-1835) - stated that volcanoes form like a bubble: first geologic forces upraise the ground and form the mountain, the summit collapses, forming the steep crater walls, finally the magma can spout trough the surface, causing an eruption. Lava flows or ash layers where therefore a secondary feature of volcanoes, not the "construction material" of the volcanic complex. This "crater of elevation" hypothesis was very popular at the time and supported by most European geologists. Two French geologists, Armand Dufresnoy (1792-1857) and Léonce Elie de Beaumont (1798-1874), tried even to prove mathematically that continuous lava flows can form only on surfaces with an inclination less than 6°, according to their calculations on steeper surface a flow start to disintegrate, and as most observed lava flows were however steeper, this observations could only be explained by the surface of the volcano steepen over time. Fig.2. 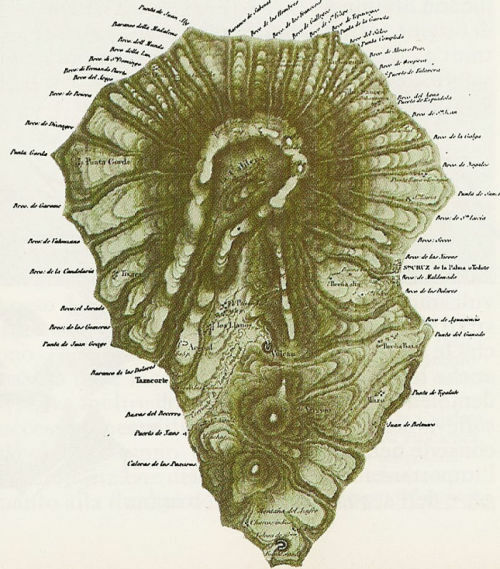 Topographic map of the Canary Island published by von Buch in 1814 in his book "Description physique des lles Canaries, suivie dúne indication des principaux volcans du globe." Von Buch assumed that the radial valleys, descending from the central summit, are fissures caused by the inflation and uprising mountain - in fact these valleys are formed by the erosion of the volcanic rocks. Darwin did not share entirely this vision of uprising volcanoes; in part the model proposed very fast rates of elevation and Darwin was more inclined to follow the gradual geology as proposed by Charles Lyell - Lyell himself refused the "crater of elevation" hypothesis outright. Darwin addressed the problem only superficially: he used the observations on St Helena to formulate an intermediate hypothesis, volcanoes rise by slow, gradual and episodic events, he also suggested that more research was necessary to map and determinate the inclination of lava flows. In 1850 Lyell demonstrated on a lava flow of Mount Etna that the lava solidified on a slope inclined by 35° - the "crater of elevation" hypothesis had lost one of its most important arguments and Darwin left behind the hypothesis of inflating volcanoes.